Also known as ‘Dardarin‘ (from the Basque word “dardara” which means “trembling”), LRRK2 is an enzyme that has many functions within a cell – from supporting efforts to move things around inside the cell to helping to keep the power on (involved with mitochondrial function). Genetic errors or variations within the LRRK2 gene are recognised as being some of the most common with regards to increasing ones risk of developing Parkinson’s (as I mentioned in the intro, LRRK2 variants are present in approximately 1-2% of all cases of Parkinson’s). As the image above suggests, mutations in the PARK8 gene are also associated with Crohn’s disease (Click here and here for more on this) – though that mutation is in a different location to those associated with Parkinson’s. And one particularly common Parkinson’s-associated LRRK2 mutation – called G2019S – is also associated with increased risk of certain types of cancer, especially for hormone-related cancer and breast cancer in women – Click here to read more about this. If you have a G2019S mutation, no reason to panic – but it is good to be aware of this association and have regular check ups. The G2019S mutation (the name designates its location on the gene) is the most common LRRK2 mutation. In some populations of people it can be found in 40% of people with Parkinson’s (Click here to read more about this). But what is interesting about this mutation is that it gives rise to a LRRK2 enzyme that is hyperactive. As a protein, LRRK2 interacts with many different types of other proteins, and you can imagine that in a finely balanced environment like the cells that a mutant ‘hyperactive’ form of LRRK2 is going to cause problems. 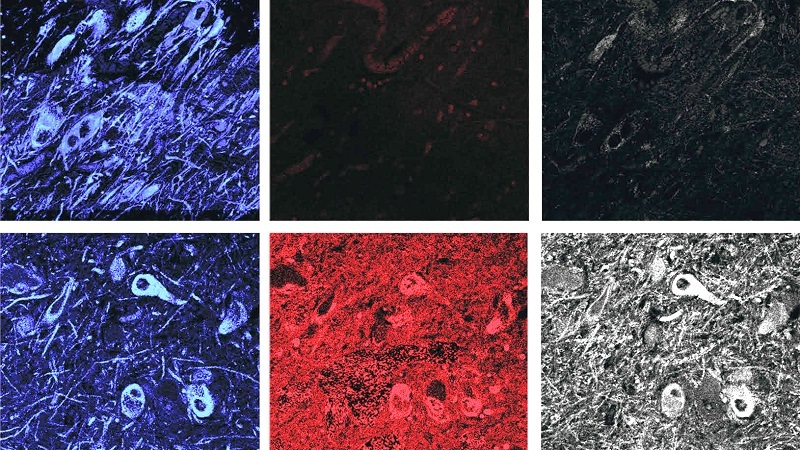 The consequences of this constantly active form of LRRK2 protein is believed to be influential in the cell death in LRRK2-associated Parkinson’s. Thus, biotech companies have been looking for compounds that help to inhibit or modulate LRRK2 activity (Click here to read a previous SoPD post regarding an example of a biotech company – called Denali – which is taking this approach). One issue with these inhibitors, however, is that they are all ATP competitive. Adenosine Triphosphate (or ATP) is the fuel which cells run on. It attaches to various proteins and ‘powers’ their function. Often ATP needs some help with binding to the various proteins, and this is where enzymes come into the picture. They will grab ATP and help attach it to a protein so that it can to do its function. There will be a binding site (or pocket) on the enzyme where ATP inserts itself and the enzyme will then attach the ATP to a specific protein (which is referred to as the protein substrate). 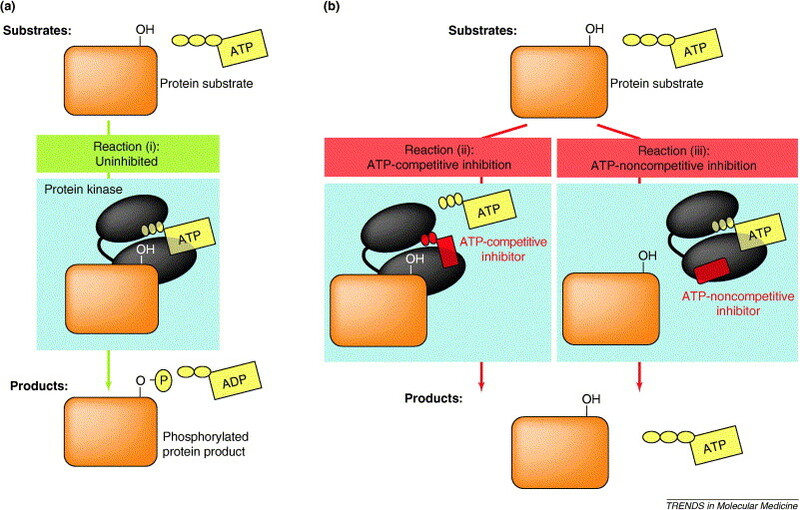 In the image below, on the left side (panel a), you will see a cartoon of a protein substrate (the orange square) and an ATP molecule. Alone they can’t do anything together, but once a protein kinase (an enzyme – the black structure) is added to the picture, ATP can be attached to the protein substrate and function can occur. ATP competitive compounds bind to the same site pocket as ATP, but the enzyme can’t do anything with it, and in turn this blocks the function of the biological pathway involved (see panel b in the image above). Many medications take advantage of this simple process to block specific biological functions. It is an attractive target for drug companies to develop novel therapies around, and sophisticated screening/filtering methods have been developed that allow for the identification of compounds that block certain enzymes from binding to ATP. There are some issues with this approach though. Firstly, the pocket where ATP binds in many enzymes and proteins shows a high degree of similarity, which means that compounds being developed to take advantage of this approach have to be highly selective – that is, extremely specific. In addition, competing with ATP inside a cell is no easy task – there is a lot of ATP inside a cell! Thus, ATP competitive compounds have to be good in order to out perform ATP. Sometimes high doses are required. Therefore, interest in developing non-ATP competitive inhibitors has risen considerably over the years. Non-ATP competitive inhibitors are compounds that bind to the enzyme and block its ability to do its function regardless of whether ATP has been bound (see panel b in the image above). I see. Are there any non-ATP competitive inhibitors of LRRK2? Until recently, the answer was basically ‘no’. Late last year (2018) a large screening study of 63,400 small molecules was conducted to seek out non-ATP competitive LRRK2 inhibitors (Click here to read more about this). 21 compounds were identified in that screen, and among these was LDN-22684, which has previously been identified as an inhibitor of LRRK2 activity (Click here to read more about that previous research). In this study, the researchers conducted a a high-throughput screening experiment of a library of 2,080 FDA-approved compounds for their ability to reduce LRRK2 activity and they discovered something very interesting: The natural compound 5′-deoxy-adenosylcobalamin (or just AdoCbl) was an allosteric modulator of LRRK2-G2019S kinase activity. What. Does. Any. Of. That. Actually. Mean? Ok, let’s start with AdoCbl. AdoCbl (also known as coenzyme B12, cobamamide, and dibencozide) is one of the enzymatically active forms of vitamin B12. 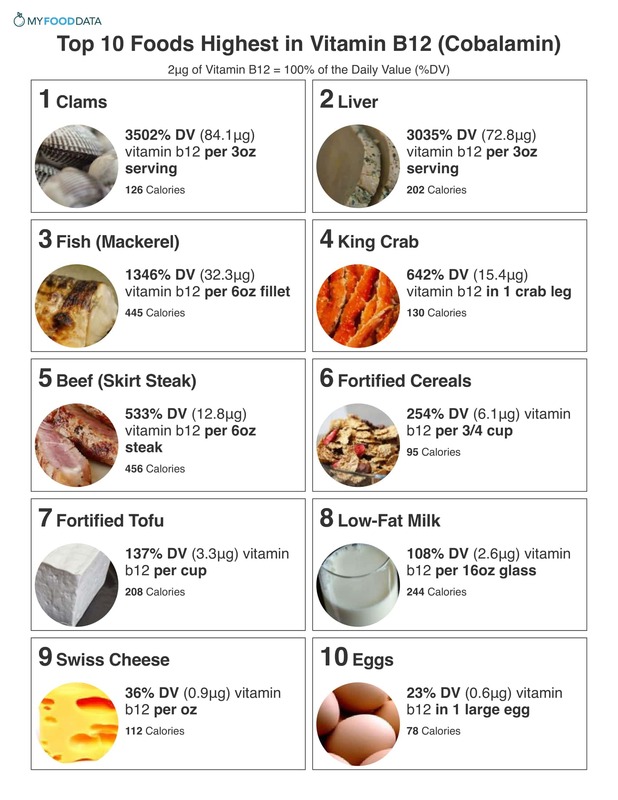 How many “forms” of vitamin B12 are there? AdoCbl is one of the most prevalent form of B12 in our body’s cells. In the mitochondria (the power stations of cells), AdoCbl plays an important role. A deficiency of AdoCbl leads to the impairment of ATP production (the same ATP we discussed above) and, as a result, this leads to chronic fatigue and exhaustion, etc. Ok, and what about the whole “allosteric modulator” part? Allosteric modulation refers to the regulation of an enzyme via the binding of an effector molecule at a site other than the enzyme’s active enzymatic site. 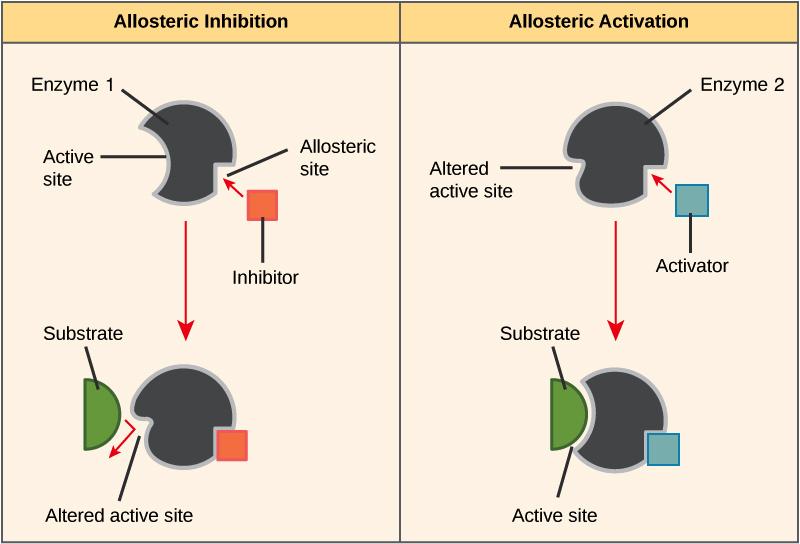 As the image below demonstrates, allosteric modulation can be inhibitory or can result in activation of an enzyme. So AdoCbl is one of the two enzymatically active forms of vitamin B12 and this new research suggests that it can modulate the hyperactive form of the LRRK2 protein? The researchers found that of the 4 forms of vitamin B12, only AdoCbl exhibited an ability to inhibit the hyperactive LRRK2-G2019S protein. The other forms of vitamin B12 were able to affect normal LRRK2 protein behaviour, but only AdoCbl had the ability to inhibit the LRRK2-G2019S protein. And it did this by binding directly to the protein. LRRK2 proteins can only function when they bind to other LRRK2 proteins (Click here and here to read more about this). This binding together is called dimerizing (or dimerization). And AdoCbl blocks the dimerization of LRRK2? So LRRK2 can’t function? It is certainly reducing the levels of LRRK2 activity (as good as many of the LRRK2 inhibitors that are being developed). And by changing the shape of the LRRK2 protein, AdoCbl was causing the proteolysis of LRRK2 – that is the breaking down of the protein. This is something the other LRRK2 inhibitors do not do. Interesting. Does this help cells survive? Yes. 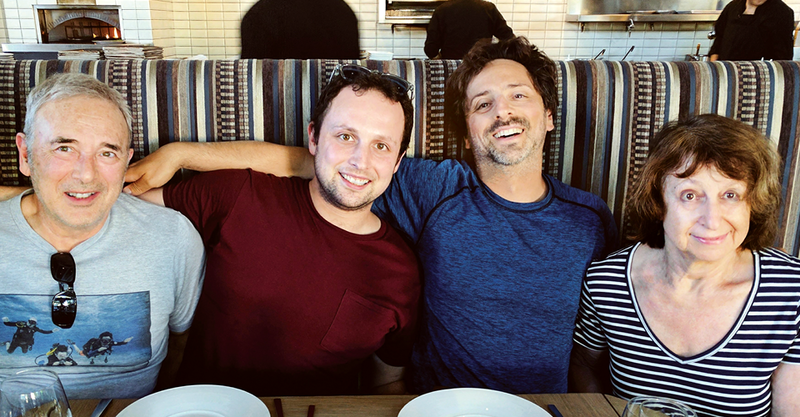 The researchers firstly found that AdoCbl treatment protects dopamine neurons in microscopic worms (C. elegans) which had been genetically engineered to produce the hyperactive LRRK2-G2019S protein. As impressive as that might sound, these worms only have 8 dopamine neurons, so the investigators tested AdoCbl treatment on a fly model of LRRK2-G2019S associated Parkinson’s (in particular, they tested AdoCbl on the visual issues associated with the model), and also on a mouse model of LRRK2-Parkinson’s. In both cases, AdoCbl treatment prevented neurotoxicity. The researchers concluded their study by suggesting that they have identified “a novel class of LRRK2 kinase modulator that can be used to probe the structure-function relationship of LRRK2 and develop new allosteric LRRK2 inhibitors in the future“. inhibitor and no Vitamin B12-mediated kinase inhibition has ever been reported“. The researchers also speculated – and this is where things get really interesting – that the results could help explain certain issues with LRRK2-associated Parkinson’s such as penetrance and progression. By this they mean that tissue levels of AdoCbl could possibly help explain why some individuals carrying the LRRK2-G2019S variant do not go on to develop Parkinson’s, and differences in tissue levels of AdoCbl could also help to explain the differences in speed of Parkinson’s progression across different people with LRRK2-associated PD. Interesting. Has Parkinson’s ever been associated with Vitamin B12 before? years (Click here and here to read more about this). Journal: Nutrients. 2015 Aug 27;7(9):7197-208. In this study, the investigator pooled data from 10 previous reports and found that people with Parkinson’s on average have lower level of vitamin B12 than control subjects. This study also reported that higher dietary intake of vitamin B6 may be associated with a reduced risk of developing Parkinson’s (we will come back to this in a future post), but there was no evidence to support that possibility with vitamin B12. Title: Vitamin B12 and Homocysteine Levels Predict Different Outcomes in Early Parkinson’s Disease. Authors: Christine CW, Auinger P, Joslin A, Yelpaala Y, Green R; Parkinson Study Group-DATATOP Investigators. Journal: Mov Disord. 2018 May;33(5):762-770.
serum samples. Serum is the liquid component of blood when the cells and clotting factors are removed. The serum was collected from individuals with recently diagnosed untreated Parkinson’s (who were taking part in the DATATOP study). hydrochloride) and/or the antioxidant, a-tocopherol could slow down Parkinson’s progression. 800 participants were recruited between 1987 and 1988. The study failed to demonstrate any beneficial effects, but as you can see the data collected from this huge study is still generating interesting data 20 years on. At the baseline sampling, 13% of the participants had low B12 levels, and at the follow up assessment the investigators found that those low B12 levels were associated with greater worsening of mobility (the average time between baseline and the follow up was 17 months), when compared to participants with normal low B12 levels. Interestingly, although the numbers were small and the differences were not significant, there were trends for slower progression (smaller annualised UPDRS changes) in those participants involved in the study whose B12 status improved over the course of the study. Has Vitamin B12 ever been tested in clinical trials? There was one study 10 years ago at Emory University that explored vitamin B12 status and response to vitamin B12 supplementation in people with Parkinson’s, but that trial was terminated and I am not aware of any results being put in the public domain (Click here to read more about this trial). Beyond that I am unaware of any clinical trials of vitamin B12 in Parkinson’s (happy to be corrected on this). The senior scientist on this new report Prof Zhenyu Yue (from Icahn School of Medicine at Mount Sinai) suggested that “Although more work and better animal models will be needed to unravel the complex biochemistry and molecular pathways of Parkinson’s disease, outside the lab it should be possible to set up human studies right now to see whether Vitamin B12 intake can slow the progression” of the condition (Source). How can I get me some Vitamin B12? Before you jump on to your favourite health supplement website, it must be understood that the new research needs to be independently replicated. We have definitely been to this rodeo before. On a semi-regular basis exciting new data comes out reporting an amazing finding, and often others fail to replicate it. I am not calling into question the results of the current study (I think that they are really interesting), I am just suggesting that the prudent thing to do is wait for others to also demonstrate the effect. That said, Vitamin B12 is considered to be very safe. It is naturally found in animal products (such as fish, meat, poultry, eggs, milk, and milk products) and generally not in plant foods. All forms of vitamin B12 are absorbed with similar efficiency in the blood stream, and they are reduced to the core cobalamin molecule once inside the cell, and it can then be converted into AdoCbl – regardless of the form of B12 ingested (Click here to read more about this). Title: Metabolic engineering of Escherichia coli for de novo biosynthesis of vitamin B12. Authors: Fang H, Li D, Kang J, Jiang P, Sun J, Zhang D.
Journal: Nat Commun. 2018 Nov 21;9(1):4917. It could be interesting to investigate whether genetically engineered gut bacteria which continuously secrete Vitamin B12 as they pass through the gastrointestinal system, can reduce LRRK2 activity in a model of LRRK2-associated Parkinson’s. Obviously, the ability of the secreted B12 to access the brain will need to be determined, but even if the B12 is not reaching the brain, if it could still help to reduce LRRK2 activity in peripheral immune cells – which could be beneficial (Click here to read more about this). What about people who don’t have LRRK2-associated Parkinsons? Could this new research help them too? Journal: Science Translational Medicine 25 Jul 2018: 10 (451), eaar5429. In this study, the investigators looked at LRRK2 activity on sections of postmortem brain from 7 individuals who had passed away with idiopathic (or spontaneous) Parkinson’s and compared them with section of brain from 8 healthy controls. Idiopathic Parkinson’s is any form of Parkinson’s that can not be immediately associated with a particular causal factor. Most forms of Parkinson’s are idiopathic, while individuals with Parkinson’s that results from genetic mutations are considered non-idiopathic. The researchers used sections of brain from an area called the midbrain, which contains a region called the substantia nigra – the area of the brain where the dopamine-producing cells reside. These cells are particularly affected in Parkinson’s, with approximately 50% of them being lost by the time of diagnosis. 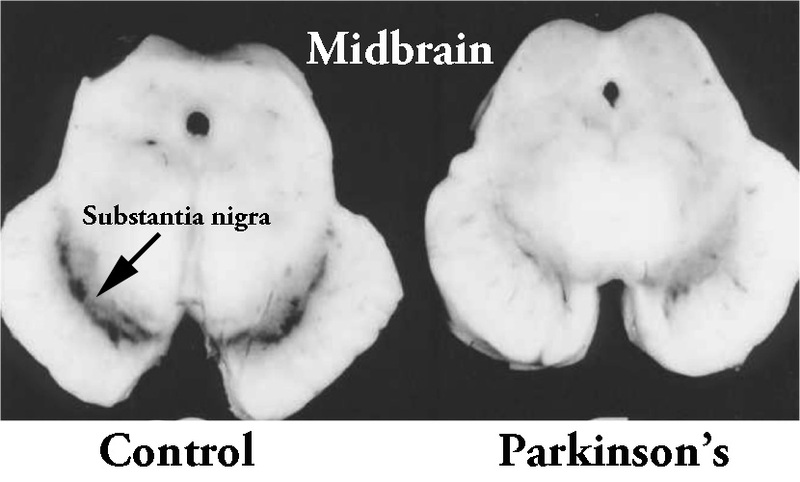 To the surprise of the researchers the remaining dopamine neurons of the cases of idiopathic Parkinson’s showed about a 4-6 fold increase in markers of LRRK2 activity (compared with the control brains). This suggested to the researchers that normal LRRK2 protein is highly activated in Parkinson’s. Interestingly, this increase in LRRK2 levels was not isolated to neurons in the idiopathic Parkinson’s brain. Microglia – the resident immune cells in the brain also exhibited twice the normal levels of LRRK2 activity. Next, the investigators looked at what happens to LRRK2 activity levels in an animal model of Parkinson’s – specifically, a model that involves a pesticide toxin (called Rotenone – Click here to read a previous SoPD post on pesticides). When they looked at dopamine neurons in animals treated with rotenone, the researchers observed a 10-fold increase in certain markers of LRRK2 activity. They also reported disruption of cellular waste disposal (or autophagy) markers caused by rotenone treatment. They also looked in a second animal model of Parkinson’s – this one involving very high levels of normal human alpha synuclein protein (caused by injection of genetically engineered viruses), and again, the researchers observed a 10-fold increase in certain markers of LRRK2 activity. In a third test, the researchers caused oxidative stress on cells and observed an increase in LRRK2 activity, which could be reduced by treatment with anti-oxidants. All of these results collectively suggest that the role of LRRK2 in Parkinson’s is potentially a lot greater than we previously thought. By using many of the factors associated with the development of Parkinson’s – such as exposure to pesticides, aggregated alpha synuclein protein, and oxidative stress – the researchers observed increased levels of LRRK2 activity. Thus, it is possible that the AdoCbl results could have a wider potential impact than simply for people with LRRK2 genetic variants. Inhibitors of the Parkinson’s associated protein LRRK2 are currently being developed for the clinic. While the first generation of these compounds had significant side effects, the lastest batch seem to be more agreeable. All of the LRRK2 inhibitors under clinical development use a similar mechanism (ATP inhibition), and researchers have been keen to identify novel mechanisms. Now it appears we have, and the data also points towards a specific compound (AdoCbl). As I suggested above, it will be important to see independent replication of this research before we get too excited, but if proven by other scientists, a clinical trial of vitamin B12/AdoCbl would be relatively straight forward to set up. We will be watching this space with interest. Tʜᴀɴᴋ Yᴏᴜ SO MUCH SIMON. Yᴏᴜʀ ᴇxᴘʟᴀɴᴀᴛɪᴏɴ ʜᴇʟᴘs ᴍᴇ ᴛᴏ ᴜɴᴅᴇʀsᴛᴀɴᴅ ʙᴇᴛᴛᴇʀ ᴛʜᴇ ᴘᴏsᴛ ғʀᴏᴍ Pᴀʀᴋɪɴsᴏɴ’s ᴘᴀᴛɪᴇɴᴛs ᴘᴏsᴛɪɴɢ ᴛʜᴇɪʀ ɪɴɪᴛɪᴀʟ (ᴜɴᴄᴏɴғɪʀᴍᴇᴅ) ᴘᴇʀsᴏɴᴀʟ ᴅɪsᴄᴏᴠᴇʀɪᴇs ʀᴇɢᴀʀᴅɪɴɢ B12 ᴏɴ ᴠᴀʀɪᴏᴜs Pᴀʀᴋɪɴsᴏɴs ʙʟᴏɢs (ɴᴏᴛ UK ʙʟᴏɢs) ᴡʜɪᴄʜ I ᴀᴍ ʀᴇᴀᴅɪɴɢ ғʀᴏᴍ ʏᴇᴀʀs. Aʟsᴏ, Yᴏᴜ ʜᴇʟᴘᴇᴅ ᴍᴇ ᴜɴᴅᴇʀsᴛᴀɴᴅ ʙᴇᴛᴛᴇʀ (ᴍᴏʀᴇ sʏsᴛᴇᴍᴀᴛɪᴄᴀʟʟʏ) ᴛʜᴇ ᴡᴏʀᴅs ᴏғ ᴍʏ Mᴇᴅɪᴄᴀʟ Dᴏᴄᴛᴏʀs ʙᴇᴄᴀᴜsᴇ ᴛʜᴇʏ sɪᴍᴘʟʏ/ᴏʙᴠɪᴏᴜsʟʏ ᴄᴀɴ’ᴛ sᴘᴇᴀᴋ ᴀᴛ ᴀʟʟ ғᴏʀ ɴᴏɴ-ʀᴇɢᴜʟᴀʀ ᴍᴇᴅ ᴛʀᴇᴀᴛᴍᴇɴᴛs. I’m glad you liked the post. 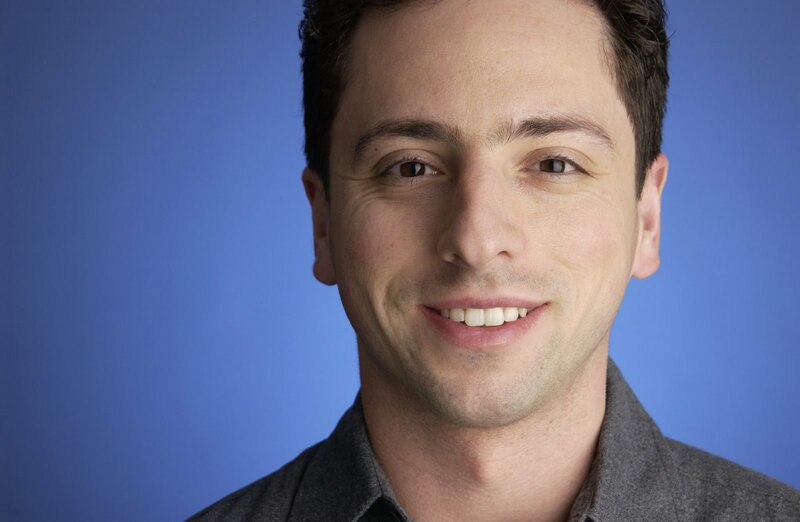 Some interesting ideas behind this story. I look forward to others investigating this phenomenon. Thank you for another wonderful post. Sorry I don’t comment enough but read every single one of your post. This post is especially interesting to me as my mentor and an early PSG member that formed with data top study has always been a very strong proponent of B12 and we currently are running a nutrition study in our Pd population around b12 levels. I am flattered that individuals like yourself are reading my typos. I certainly follow your website ( https://danishbhatti.com/ ) – recommended reading for anyone interested in Parkinson’s. A wealth of information. I would be very interested to very interested to learn more about your B122 research. I will contact you offline. Dr. Ahlskog of mayo clinic recommends every person with PD take b vitamins including b12 because sinemet can mess with b vitamin levels. So, very safe, possibly needed anyway, possibly disease modifying? As long as one checks ones optimism, why not take b12? Better yet, be optimistic – placebo effect helps to. I should end my post with a question mark. Am I missing something? 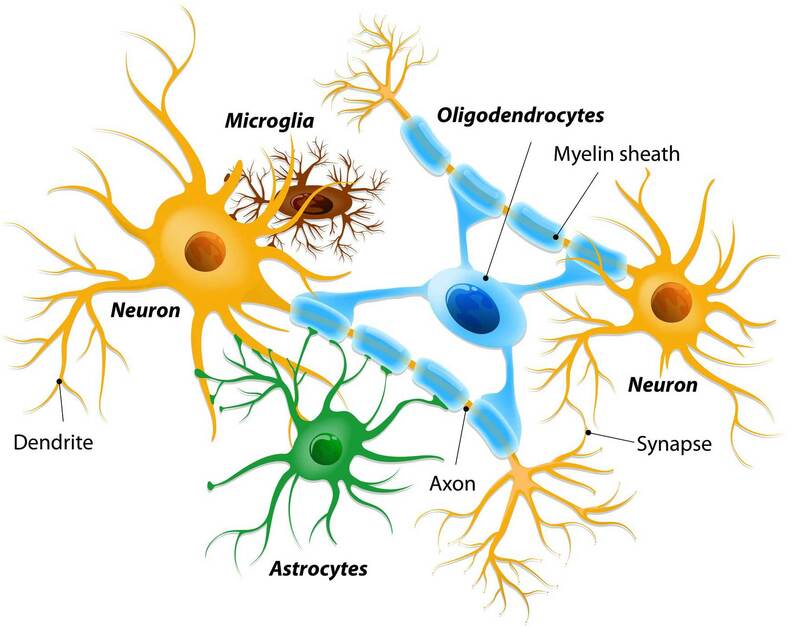 If I were a billionaire, among other things, I’d dump money into generating a computer model of a DA neuron. Would be great if we could run the first pass high throughput stuff via a simulation. Also it could be used as a vehicle to mine new approaches. That is certainly the future, just not sure how far away. B12 now added to my DIY cocktail for iPD.